Everyone wants to make new friends when they start college, but you don’t always find your people the first place you look. 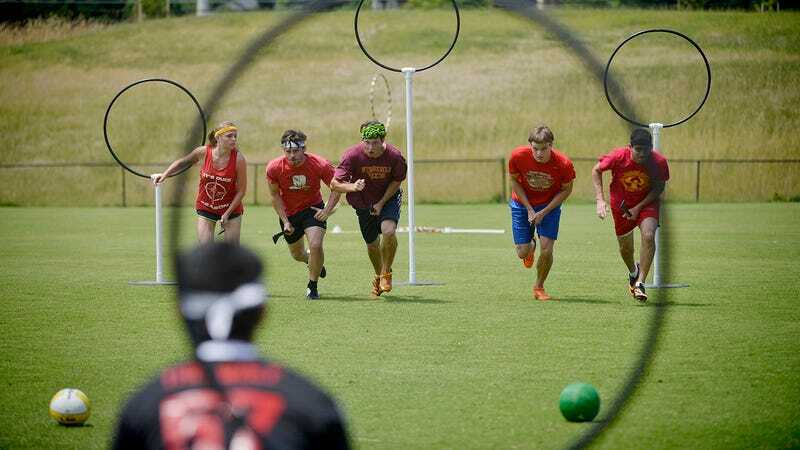 Here are five eager freshmen who joined the Quidditch Club to meet new people, ranked by how quickly they dipped out to find some regular kids to hang with. You’ve got to hand it to Theresa for really trying to stick it out with the quidditch kids. She took a bunch of quizzes on Pottermore to tell everyone what her Hogwarts house was, and she was hanging out with the team pretty frequently. She even scored a couple points in the first game before reaching her breaking point when the group walked into the dining hall right when it’s most packed at dinnertime humming the Harry Potter theme song as a post-game ritual. Horrified that her peers might see her singing with the team, she snuck out of the dining hall, deleted the QuidditchClub2k18 GroupMe off her phone, and texted her roommate to see if she was still planning on playing Edward Fortyhands with her 27-year-old boyfriend. Next up is Ben. Figuring he’d have a lot in common with the Quidditch Club kids since he spent grade school dressing up as Ron Weasley to go to all of the midnight premieres, he excitedly signed up for the team. But after only a couple of weeks, Ben started showing up later and later to practice so he could skip the really intense Harry Potter trivia they’d do while warming up. He finally hit his max when he was asked to jump up in the air on his broomstick to pose for the team photo. To avoid being forever immortalized as a Harry Potter obsessive in the yearbook, Ben made up a lie that he left something back in the locker room, where he started chatting with some intramural soccer players who he wouldn’t mind being seen with in public. Addison never read any of the books, but he’d seen some of the movies and figured this would be a chill way to make friends. But once he was out on the field at the first practice, getting told “You’re a wizard, Addison!” as encouragement from his psychology TA wearing a cloak, he realized there was no goddamn way these freaks were going to be his lifelong college friends and he walked right off the field and over to a Delta Chi recruiting table. Mira was already tapping out during the first meeting when everyone had to explain which type of wood their wand would be made of to introduce themselves, but it wasn’t until the team played a tutorial game on the gym floor that she pretended to go to the bathroom and left for good. Watching people her age sprint around with brooms between their legs like it was a real sport was all the proof she needed that she’d be better off eating lunch alone for a couple weeks until she could make some normal friends who wryly mock people in Harry Potter clubs or LARPing meetups while they take edibles on the quad. Coming in at No. 1 is Raquel, who, all things considered, barely gave it a chance. Raquel meandered over to the quidditch booth at the activities fair during orientation week, but she immediately discovered she wanted no part of what they had to offer after the “seeker” started going on and on about how their season banquet is an authentic Yule Ball, like that was the main selling point. She didn’t even write down her email address or phone number on the sign-up sheet—all she wrote was “Raquel” and a squiggly line for her last name before deciding that if she was going to do a dorky thing in college, she might as well hang out with the nerds who study hard instead of the ones who spend all their time miming a wizard sport.